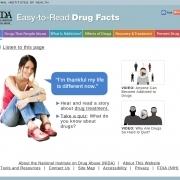 Palladian Partners, an Altarum subsidiary, recently played a prominent role in the National Institute on Drug Abuse (NIDA) campaign to use the Web to reach out to low-literacy audiences. 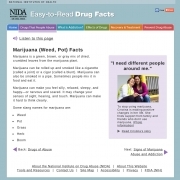 Palladian worked closely with NIDA staff to develop the first-ever, easy-to-read website on drug abuse, designed for adults with low reading literacy (eighth grade or below reading level). The site uses plain language, large fonts, animated videos, and other innovative features to provide information about the neuroscience of drug abuse and the importance of drug abuse treatment and prevention. The crisp, clean design contains minimal text and plenty of white space. Users can listen to an audio version of the content and can have the text highlighted as it is read. Engaging motion graphics videos explain the science behind addiction. One of the few health websites targeting adults with low literacy, in many ways this is a groundbreaking site. And it comes at a particularly crucial time. Millions of Americans struggle with literacy. In fact, according to a U.S. Department of Education study, 43 percent of the population reads at a basic or below-basic level. This has serious implications as we rely more heavily on the Internet and other digital channels to convey important health information. or reads? And further, how do we know what they understand what we say? It's the health communications version of relationship counseling. A couple of years ago, a study in the Archives of Internal Medicine found that most hospitalized patients (82 percent) could not accurately name their physician. Even more worrisome, almost half of the patients polled did not know their diagnosis or why they were admitted. But it's the other part of the study that I think is particularly relevant for health communications. When the physicians (i.e., the communicators) were asked those questions, 67 percent thought the patients knew their physician's name, and 77 percent thought the patients "understood their diagnoses at least somewhat well." Although 98 percent of physicians reported that they had discussed their patient's fears and anxieties with them, only 54 percent of patients thought they had done so. Clearly there was a disconnect. So how do we, as health communicators—no matter where we may be, from public health prevention to the delivery of clinical services—improve understanding? How do we bridge the communication gap—or, in some cases, the chasm? The answer is in part provided by our experience with the NIDA low-literacy website project: We must ask. None of the simple, straightforward website features described at the beginning of this post were proposed or implemented based on gut feelings. Rather, we conducted extensive formative research on how adults with low literacy use websites, and what barriers they face in accessing and understanding online information. We partnered with literacy organizations to obtain valuable audience insights directly from adult learners and educators. The adult literacy educators also provided expert feedback on our Web usability testing techniques, which we had adapted for adults with low literacy. Often, what we learned surprised us. Many of our assumptions about traditional best Web practices were upended, and phrases we thought were intuitive turned out to be difficult for the target audience. But we listened, and we acted based on what we heard. Although better communication won't solve all of the ills of our health care system or serve as a silver bullet for the challenge of persistent health disparities, it must be part of the solution. We should continue to look for ways to involve our audiences in our efforts. By so doing, we'll know what users want and need, instead of taking our best shot and hoping we hit the mark.